Setup and structure are simply designed with "Wireless Communications" on the main menu (and "Send Minigame" on that menu). Opening credits are unskipable and are of average length. Download time is around 40 seconds. Menu options are located on well-labeled bars with clearly defined borders and sufficient buffer space. 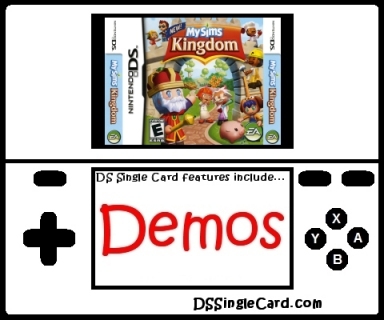 Playing MySims Kingdom's downloadable demo is really easy to do. The entire demo is based solely on speed and tap: tap the right things as quickly as possible. The items to be tapped (the "vegetables" on the lower screen) are clearly bordered and are programmed for an excellent sensitivity ratio. It would be nice is the vegetable areas were larger at the easier difficulties, making a better use of space, but what's there works exceptionally well. Graphically, the game looks and feels exactly like it should. The game features 3D characters with the vegetable graphics being a 2D/3D hybrid design that matches the style of the rest of the game. The background music is alright for the short period of time a single playthrough takes, but it will quickly become tiresome. Much more annoying are the noises the customers make (you'll be tired of those sounds by the second or third customer). It's much less frustrating to play the demo with the sound turned off. Feature-wise, the game has three different difficulty levels (all of which are different enough to be easily distinguished from each other), but that's the only selectable option. My impression of MySims Kingdom left me... wanting. Technically, the game is errorless. Gameplay is exactly as the designers and programmers had intended. The presentation was also solid. The choice of mini game, however, is what bothered me. Again, there was nothing wrong with it, but it didn't seem (to me) to have any depth at all. The entire gameplay spectrum consists of "tap the right place" with no strategy involved at all. I don't have a problem withn the tapping mechanic, but since that's it and there's no strategy involved at all, I felt a little cheated. I don't review the single player experience here, but it's a full storyline with an expanded experience. By comparison, well... there is no comparison. On its own, however, the game works correctly and plays fine, but I'd have to call it "average" as a deownloadable demo. I found the Paragliding demo from the original MySims title to be more fun. Enlarge the tappable vegetables on the lower screen for the earlier difficulties. Allow players to select different play times. Provide choices of several downloadable demos. Offer several downloadable demo mini game selections and several multiplayer downloadable mini game selections. Include one side task in the main game that requires a Single-Card Download connection with a friend in order to receive the help the task requires for completion.